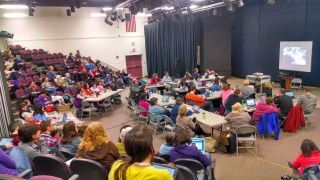 Google Summit attendees in Vermont. Whether it’s Docs, Earth, Glass, Translate, Voice, Hangouts, Blogger, Chromebooks, and more, Google provides some of my favorite tools for education. If you feel the same way or are just intrigued, you may be interested in a Google for Education Summit. Do you want to experience the world through Google Glass? Did you know Chromebooks are instant on? Summits have a dedicated classroom where you can drop in any time to demo Google products and learn more about using Android tablets in Education. Presenting a session during summits is a fantastic way to highlight your expertise and raise your profile in the Google for Education arena. Many educators who have attended past summits have grown their practice and experience and are coming back as speakers. The main objective of the summits is to have you return to work equipped with new knowledge you can implement right away. For two days you are completely immersed in the Google for Education world where you experience up to five sessions running concurrently and up to five focused sessions a day. There are sessions for all levels of users - from complete beginners to advanced users. Thinking about moving to Google Apps? Summits provide an opportunity to look at the viability of Google Apps adoption where you work and discuss issues around deployment and use with experienced users. Whether you are looking for new career opportunities with Google schools, interested in making new friends, or just want to exchange best practices with fellow educators in a casual setting, the daily networking aspect of summits is important. There is also a networking party at the end of day one of the summit. Summit sessions are lead by Google Certified Teachers, Google Education Trainers, Google Apps Certified Administrators, Google Certified Deployment Specialists, other experts in the field and even Google employees! You will have lots of time to interact with them during and outside the sessions. The “Google Certified Educator” and the “Google Education Trainer” are internationally recognised certifications and excellent qualifications for your professional development and career opportunities. Summits have sessions with detailing the application process and can guide you with the steps so you can join the global community of trainers. AppsEvents offers a one day pre-summit training course to help prepare you to complete the certification process which comprises of five online tests, a completed application and a case study. A Google in Education summit is mainly focused on the Google Apps for Education core package however sessions can also extend to other existing Google products. Summits feature focussed sessions on utilizing Google Maps and Google Earth in education lead by GEO experts. Find out how Android tablets can assist learning in K-12 and higher education. Summits have exhibitor areas to showcase software, products, and services. This provides a great way to learn about what’s new right from the horse’s mouth. Interested? You can join any of the upcoming 2-day US summits this year - May 24 & 25, Monterey Bay California; June 21 & 22 Connecticut; and on November 2014, Arkansas. You may also want to consider the AppsEvents one-day Google Apps EDU Certification preparation bootcamp. For a listing of upcoming summits, registration information, and fees (approx $250) visit http://www.appsevents.com.